The term "Rosicrucianism" refers to a philosophical secret society founded in medieval Germany by the legendary founder Christian Rosenkreutz. The term derives from the Latin words "rosa" and "crucis" which meant "rose cross". The doctrine of Rosicrucianism is based upon three published documents: Fama Fraternitatis, Confessio Fraternitatis, and The Chymical Wedding of Christian Christian Rosenkreutz. These documents recount the life, travels, and death of Christian Rosenkreutz, hereafter referred to as "C.R.C.". While the author was anonymous they are attributed to Johann Valentin Andreae, a German theologian. The philosophy of Rosicrucianism is built on ancient truths that have been concealed for centuries that deal with nature, the universe, and spiritual enlightenment. Rosicrucians are also devoted to the study of these ancient truths and philosophies, and spreading this light among the public. The most common symbol of Rosicrucianism is the Rosy Cross. According to these documents, C.R.C. was born in 1378 and lived for 106-years. When he was 5-years old, his family was murdered, but he was secreted away and taken to a monastery or "cloyster" where he was raised and educated (learning Greek and Latin). As he grew up he, along with some monks, decided to devote their life to gaining enlightenment and headed out on an adventure to the Middle East, under the pretense of visiting the Holy Sepulcher. The journey proved perilous and soon two of his companions died, leaving C.R.C. alone. He headed for Damascus, an intellectual refuge from the invading Mongols, and, on arrival, learned Arabic and immersed himself in all the wealth of knowledge contained in that city from mathematics and astronomy to Sufism and other forms of ancient mysticism. He left and is said to have visited Damcar, whose location is unknown today, but afterward then entered into Egypt before going to Fez for several years. It was in Fez that he learned divination and the secrets of Nature. His ultimate goal was to spread the information he had gained from his travels. He returned to Europe by first going to Spain. He attempted to pass on this information, but he would be disappointed as his words fell on deaf ears. The scholars and theologians of the time were reluctant to neither receive any new kinds of idea nor believe any suggestion that their beliefs were flawed. He came to the understanding that he must slowly push this information to the public and leave plans that future generations may continue his work. He returned to Germany around 1407, established a secret group that existed centuries without being known, and initiated a select few (believed to have been no more than 8-members). 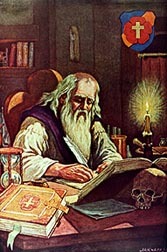 Each initiate was learned in the medicinal arts and swore an oath to heal the sick without payment; wear no special clothing, but wear the clothing and adopt the customs of the land they were in; to maintain a secret fellowship for 100-years; use "RC" as their seal; and had to find a replacement before he died. These followers of C.R.C. would meet annually and, if they could not attend, had to justify their absence. These obligations contain important lessons of humility, generosity and charity, temperance, selflessness, modesty, chastity, and prudence. Around 1484 C.R.C. passed away and the only ones who knew where he was buried were the two followers who stayed with him after the initiation, and this secret they would take to their graves. Some wonder if this was kept secret as to prevent grave desecration by those who may consider the Rosicrucians heretics. According to the Fama Fraternitatis, the burial site was to be discovered after 120-years. The burial chamber was a vault with 7-sides that were each 5-ft wide and 8-ft tall. Each wall was divided into 10-squares with figures and sentences to be explained to the initiates. Each wall had a door that contained many different items from historical documents, instructions, and other devices. The altar had to be pushed aside to find the body of C.R.C. which appeared to be perfectly preserved. The discovery of his tomb is thought to coincide with the public announcement of the order's existence. In the beginning the Rosicrucian manifestos did not cause much of a stir, but with the 17th century it started to cause a buzz as the continent was ravaged by war and this secret group was said to exist to transform and enlighten, a glimmer of hope in some dark times. Due to the secrecy and absence of any public appearance, many denounced the documents as a hoax while others stood up in defense of the principles discussed in the manifestos. Real or not, these documents caught the imagination of intellectuals and esotericists across Europe. Many documents and groups would be influenced by the Rosicrucian manifestos, and inspire many famous figures of the Enlightenment Era like Robert Fludd, René Descartes, John Dee, Francis Bacon, and Elias Ashmole. Rosicrucianism declined a bit during the 18th century, but would new Rosicrucian based societies started to appear again in the mid-19th century such as the Masonic Rosicrucian Order known in the United States as "Societas Rosicruciana in Civitatibus Foederatis". The most common symbol of the Rosicrucians is the Rosy Cross, a cross with a rose attached at its center. This symbol is to remind one of the ancient mysteries through the study of nature, alchemy, astrology, philosophy, theology and so on. Let's look at each symbol individually. As discussed in earlier articles, the cross is a very ancient symbol. While it may vary in shape it is essentially a combination of two intersecting beams, a vertical one crossing a horizontal one. Before its use by Christians, the cross represented the Sun or has been a symbol of Earth and nature with the number four representing the Cardinal directions, the changing seasons, the four winds, the quarters of the moon, and the alchemical elements. The cross may also emblematically represent the union of Heaven and Earth. For the Christian, the number four (4) also reminds us of the Four Evangelists and their Gospels. By it are we reminded of time and the delineation of seasons, as it was on the Fourth Day that God put lights in the firmament to separate light from darkness, to mark days, and to outline the passing of seasons and time. The cross can be seen to represent the four elements which at its intersection symbolize the 5th element, Ether or quintessence, in Alchemy. Of all the flowers, the rose is a singular example of a natural form that has been included in the symbolism of many cultures, spiritual traditions and folklore throughout the centuries. The rose is also a symbol that has been used since time immemorial. The rose has many interpretations such as purity, life, death, love, beauty, but the most notable interpretation of the rose in this context is that it represents secrecy. The phrase "sub rosa" is a Latin for "under the rose" used to denote secrecy or confidentiality. When assembled, if it was to be understood that anything said in the meeting was to never be repeated elsewhere, the Romans would hang roses from, or paint them on, the ceiling above the table - "sub rosa". The use of the rose as a symbol for secrecy goes back to ancient Greek and Egyptian mythology, where the rose was also a symbol for the god Horus (son of Isis). Although Horus was the sky god, represented by a man with a falcon for a head, he was sometimes represented as a child. In Egyptian artwork, the child was often represented by a naked child with his finger on his mouth as if sucking on it, to denote youth, but the Greeks misunderstood this gesture to mean "secrecy". The Greek's translated the name of Horus to which they now have the Harpocrates, the god of silence. It was adapted in Greek lore that Aphrodite gave her son, Eros (or Cupid), a rose. He in turn gave this rose to Harpocrates, god of silence, as a bribe to make sure that the indiscretions of the gods and goddesses were kept "under wraps", concealed. Harpocrates was often represented as a chubby infant with a finger to his mouth. For Christians, the rose symbolized Jesus Christ, the Blessed Redeemer and Savior. The rose is also associated with the Virgin Mary as well as the martyrdom, passion/charity, and resurrection of Christ. The red rose, specifically, is symbolic of the blood of Jesus as it is said that a rose bush grew from the site of Christ's death. With the rose's beauty, it is also contrasted its thorns, we're also reminded of the Crown of Thorns the Savior wore, and thus we see the rose become the ultimate symbol of Christ's sacrifice. With a 5-petaled rose we also see the symbolism of the passions of the Blessed Redeemer and the wounds he suffered upon the cross. As mentioned above, the Rosicrucian Manifestos were written in the early 17th century and published in Germany. They make known the existence of a secret order known as the "Brotherhood of the Rose Cross". Fama Fraternitatis was the first document. It was published in 1614 and discusses the life, travels, and death of "Father C.R. ", who is also called "C.R.C." and will in another manifesto be known as Christian Rosenkreutz. It also discusses the Rosicrucian agreement or obligation that was discussed above as well as the discovery of the tomb of C.R.C. The Confessio Fraternitatis came second and it was published in 1615. This manifesto talks of the secret order and its desire to transform Europe and bring it to a golden age of enlightenment. This manifesto is a completion of the first and in a way defends and justifies it. The Chymical Wedding of Christian Rosenkreutz came last and was published in 1616. This document varies greatly from the first two in style and the subject. It is an allegorical story divided into "Seven Days" and tells us about Christian Rosenkreutz, who was invited to go a wonderful castle full of miracles so he can assist in the "Chymical Wedding" of the king and queen which is believed to have taken placed around Easter. Chymical is spelled using a "y" so as to refer to alchemy many believe. There are similarities between the stories of this manifesto and those found in the Holy Bible. There are also nine Lords who are said to be the nine (9) books of the New Testament: I Peter, II Peter, James, Jude, I John, II John, III John, the Gospel of John, and Revelations. The first is short but dangerous, and one which will lead you into rocky places, through which it will scarcely be possible to pass. The second is longer, and takes you circuitously; it is plain and easy, if by the help of the Magnet you turn neither to left nor right. The third is that truly royal way which through various pleasures and pageants of our King, affords you a joyful journey; but this so far has scarcely been allotted to one in a thousand. By the fourth no man shall reach the place, because it is a consuming way, practicable only for incorruptible bodies. The first path speaks of rocky places and reminds one of Saint Peter, "the rock" upon which the Catholic Church is founded. The second path is thought to be referring to the Gospel of John as C.R.C believed that was the only one of the gospels that is historically plausible. The third path is thought to refer to Peter, James, Jude, and John. The fourth path is the letters of Saint Paul. The manifestos communicated the idea that Christians didn't need to be under a Pope nor afraid to study the arts and sciences. These documents and its members sought to be protected from suspicion and paranoia so that they could study in peace and not be labeled heretics by those who dwelled in intellectual darkness. This was but a very brief introduction to this philosophical and often misunderstood belief system. We may never really know if Christian Rosenkreutz was real or allegorical, nor is really relevant as he did not invent the doctrines he followed, but cultivated and perpetuated those things which he discovered in his legendary travels. These documents which immortalized this figure came about during the Age of Enlightenment and had a profound effect on many historical figures, some of whom were tied with the Masonic fraternity and we see some kind of influence in some of the degrees and bodies of Masonry.